Mens Sherwani Suits online | Pakistani Indian Wedding Sherwani for Groom. We have a great variety of Indian Pakistani Sherwani dresses for men available. Our designer sherwani suit is hand made with the finest embroidery over it. 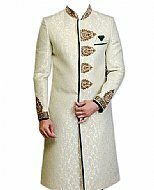 Indian sherwani dresses 2019 are worn on special occasions. Sherwani is a traditional Pakistani dress. Classic sherwani is long coat, buttoned up in front with ban collars. 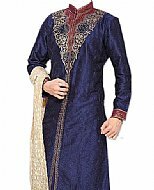 The sherwani dress falls well below the knees and looks elegant. It is worn by men over the Kurta and can be paired with a churidar pajama or a shalwar. Our classic sherwani is available in many colors. Mostly off-white, beige, black, cream shades are more popular in men. Since its start, the designs of Sherwani suits have undergone exceptional changes that have made it one of the most demandable pieces of art. Every man would love to look different and classy in his attire and nothing seems to beat this classic dress. See our blog about Pakistani dresses for more details. 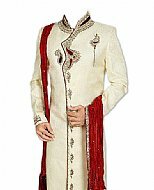 There are various types of fabrics that are used for designing great looking wedding sherwani for groom. We can stitch classic and traditional sherwani dresses on your request. You can choose from our standard sizes or use our custom size form to enter your own sizes. We make Pakistani Indian sherwani suits especially for you considering your unique requirements and sizes. The turban is traditional headgear worn by the men of both the sides during wedding. Wedding turban is a necessary part of a traditional Pakistani sherwani suit dress, a must groom attire. The colorful turbans are made of various materials; chunri or sheer cotton drape, with or without zari work. The groom's turban is traditionally red in color, and it goes well with off-white sherwani suits. "I have received my order today - thank you! It is simply beautiful.